We’ve all been there – the awkward conference. We’ve all said them. We’ve all heard them. Networking platitudes are fine, but let’s be honest, they’re usually going nowhere. “For most of us, it’s kind of daunting. It’s not a fun thing to do unfortunately,” Michelle Rosa, President of Young Government Leaders (YGL), said at GovLoop’s free “How to Learn to Love Networking” after-work event on Tuesday, designed to offer useful practice and advice for networking. Rosa was one of two speakers for the night, along with Miguel Aviles, YGL Chair and member of the YGL Advisory Panel. Networking doesn’t have to be painful, though. While it might be unnatural, it’s a skill to be gained, and improvement in it can yield great results. 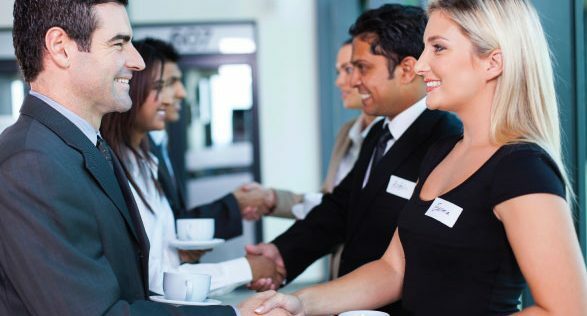 Promotions, new jobs and lifelong connections are all common results of networking. But how do you get to that point? Throughout the night, Rosa and Aviles offered advice for government employees hoping to learn about networking and provided several drills to sharpen skills. In case you missed the event, here are a few takeaways. At networking, it can be easy to get caught in the same pitfalls as everyone else. After all, it’s an awkward situation. But even difficult as it may be, learning to love networking requires forgetting the basics and approaching it from a new angle. Your new mindset starts with your introduction. Tempting as it is, asking someone what they do rarely yields a productive, meaningful conversation. In the best-case scenario, they’ll have a job similar to yours, but then where do you go from there? Instead, meaningful networking is the result of significant conversation, which comes from more than a job title. Look for a piece of content or a trend to comment on instead of a general introduction. Simple advice can be hard to follow. For example, avoiding awkwardness is a given, but putting that into practice is far more challenging. For one, don’t get attached to one person throughout. When a conversation dies down, let it go. Exchange practicable information, share your contact and look for chances to connect in the future. Also, avoid disrupting important group meetings. Nobody would begrudge you for entering a networking circle, but pick your spots and go with the flow. When entering a conversation, be authentic and natural. An elevator sales pitch or self-promotional spiel won’t do you any favors, and it will kill conversation swiftly. Finally, go to places where it’s easy to be social. In the office, that might be the water cooler but at networking, it’s wherever the food is. Look for commonalities or a question to ask, and start a conversation. “The smile is powerful on these occasions,” Aviles said. Just as you might know where and who you’d like to meet, know what you’d like to talk about. If you’re into college sports, ask someone where they’re from. If you’re hoping to attend specific sessions, find people who are doing the same. These avenues cement a solid foundation for conversation and remove filler speak. While networking is an unnatural social experiment all around, who you are can make a difference in what the best approach should be. If you’re not the type of person to open up easily, then don’t force it. The worst thing you can do at networking is come off as fake, so find a connection with somebody and grow it organically. Sometimes, you just need a wingman. Much like at a crowded college bar, the easiest way to strike up a conversation can be by introducing yourself and a friend. That way, you’re approachable, comfortable and less responsible for carrying the weight of the conversation. At the end of the day, networking is just part of work, so set steps and goals for yourself. This could be as methodical as knowing who you want to talk to and what you want to talk about, or as simple as leaving with five business cards. Don’t let your focus wander. Business cards and LinkedIn connections are great, but even better is one meaningful and relevant connection. Really tune into what others are saying and look for an opportunity to venture beyond average, on-the-street small talk. Even if you find small talk easy, your conversation counterpart might not. To network effectively, establish common ground and stable footing. From there, you can actually talk about the important topics at hand. If you find yourself rambling or the other person happens to be taciturn, find ways to involve them and learn more. A valuable connection can be missed because of a one-way conversation, so ask open-ended questions to discover more about the person next to you. “We tend to forget that networking is just a conversation,” Rosa said. Keep it simple, and remember that nobody’s a natural networker. Find out what works for you, and put it into practice.